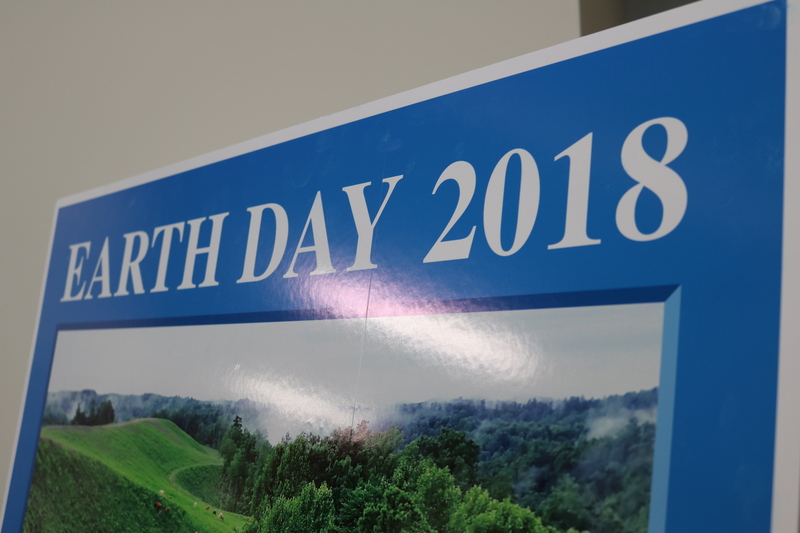 Clear sunny skies created the perfect day for the Energy and Environment Cabinet’s 2018 Earth Day celebration on April 27, at the 300 Sower Building in Frankfort, Ky. More than half a dozen divisions representing both the Department for Environmental Protection and the Department for Natural Resources had exhibits that were open to both the public and employees. Other exhibitors included The Raptor Rehabilitation of Kentucky, Woods and Waters Land Trust, Franklin County Solid Waste, Kentucky State University, the Cabinet for Health and Family Services, Glean KY, Life Adventure Center, KET and Together Frankfort. Cabinet employees toured exhibits set up by the Kentucky State Nature Preserves Commission, the Kentucky Environmental Education Counsel, and the Divisions of Water, Forestry, Air Quality, Compliance Assistance, Waste Management, Mine Reclamation and Enforcement and Abandoned Mine Lands. Nicholas Gravitt , the youngest attendee at the celebration, came with his father, Jeff Gravitt, an Administrative Specialist III with the Division of Conservation. Nicholas was quick to say the raptors were his favorite part of the celebration. A leech and water bug. An almost invisible water bug is shown.